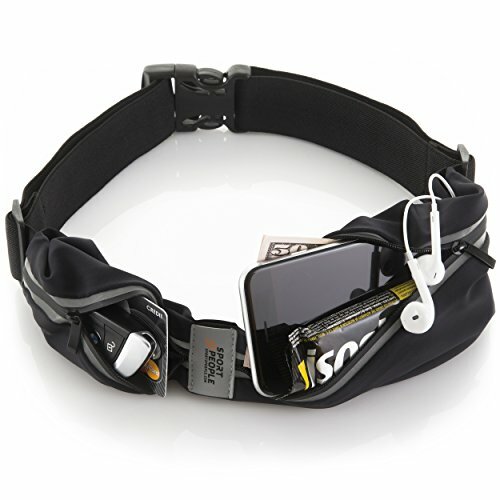 If you are a runner this pouch belt is perfect for you! Best Running Belt You Can Find or your money back! ENJOY OUTDOOR OR GYM ACTIVITY CAREFREE AND HANDS-FREE! Now you can keep your smartphone and other necessities safe and concentrate on your running! TWO POCKETS, LARGE ENOUGH TO CARRY ALL YOU NEED. SAVE YOUR PHONE FROM SCRATCHES: Running pack with 2 expandable pockets, one large, one small. Now you can handle the phone without other stuff accidentally falling out. Amazingly COMFORTABLE runners belt. IT DOESN'T BOUNCE. No rubbing. WATERPROOF: high-quality waterproof material with a special-shaped zipper will keep your items dry in almost any weather condition. ADJUSTABLE LENGTH 27.5" to 40.5". SPECIAL EARPHONES HOLE for a pleasant workout. BE SAFE AND SEEN IN THE DARK. SAFER, EASIER and MORE COMFORTABLE TRAVELING: Roomy running fanny pack for your valuables, put it around your waist, cover with shirt or jacket. Perfect for storing your essentials during large crowd events, sports or water-related activities etc. HAVE MORE FUN DURING ACTIVITIES with THE BEST runners waist pack: If for some reason fitness belt isn't working out for you, contact us for a full refund. We are US Company with a quickly responsive "Our-job-is-to-make-you-happy" Customer Service.